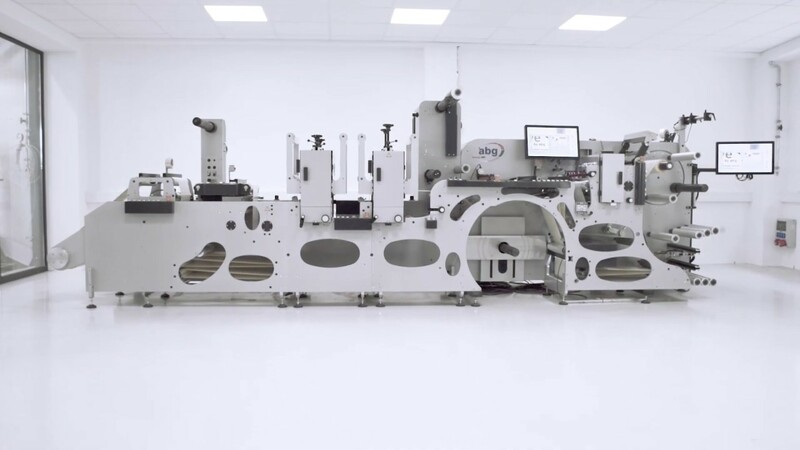 Systems with an extremely high performance are required in order to inspect labels or other printed web goods and detect faults with 100% reliability at speeds of up to 350 metres per minute. AB Graphic produces such machines and in doing so uses image processing from STEMMER IMAGING. Five label webs run in parallel on the Omega SRI, a further processing machine for labels that Ralf Wirtz is currently preparing for delivery to a customer and on which he is performing the last tests. "The main task of our machine is to cut the incoming strands and to rewind them onto individual rolls, because the further processing companies generally require single-web labels", says the sales manager of AB Graphic International GmbH. The machine that Wirtz is just finalising is designed for tape widths of 430 mm, but AB Graphic covers widths from 210 to 1200 mm as standard. The dimensioning of the label rolls is just one of many possible options, however: "Depending on customers requirements we can extend the basic functionality of rewinding the label rolls with the addition of various optional functions", says Wirtz. A frequently used variant here is the integration of printers, which add sequential batch numbers or individual details to pre-printed labels, for example. AB Graphic also offers its customers options for the inspection of labels by adding machine vision modules from the fleyeVision family to the systems. These modules are the speciality of the German branch of AB Graphic: within the British group they are also developed and manufactured at the Baesweiler location near Aachen under the designation fleyeVision. "An estimated 80 percent of the label machines manufactured by us here are equipped at the customer's request with one or even two vision modules. For machines produced in Great Britain that are ordered with a vision system, we prepare the modules here and send them to our British colleagues for installation and for the finalisation of the machines." In order to secure the quality of every single label, various features of the labels are checked with the fleyeVision modules in the processing chain. For instance, they detect missing labels, splice points, matrix residues, label damage, ink residues and dirt spots amongst other things. Such faults must be identified 100% if possible, because in certain cases the label manufacturer may face extremely high demands for compensation if, for example, faulty labels have been affixed to end products and are therefore returned to the manufacturer. It can also be very expensive if production processes, for example in bottling plants, come to a standstill due to faulty labels. In the case of pharmaceutical products the consequences may be even graver, with danger to patients being conceivable. Regardless of whether the customer wishes to ensure the quality of graphics, texts, barcodes or colours, or to check the correctness of variable data: with fleyeVision we have the right solution for every task – and that means for every material, every language and every typeset font. In order to rule out this kind of risk, AB Graphic offers its customers a large number of modular extension options for the fleyeVision system, which allow the inexpensive, tailor-made configuration of inspection systems in accordance with the customer's requirements. According to Wirtz, a particular strength of this AB Graphic solution is that fleyeVision can also easily be retrofitted to existing printing machines, machines for the manufacture of plastic films, rewinding/assembling/packaging plants or other endless processes. "fleyeVision is designed to be a stand-alone system, but it is also simple to retrofit to any printing press or assembly/packaging machine, regardless of the manufacturer. Integration into both digital and conventional processes is possible." Since 2004 AB Graphic has placed its trust in STEMMER IMAGING as the supplier of the majority of the imaging hardware used in the systems manufactured in Baesweiler. "We have been procuring the majority of our cameras, image capture cards/frame grabbers, lenses, lighting and cables for our systems from this partner for many years and we've had nothing but good experiences", Wirtz reports. "Over the years our requirements have continuously developed and STEMMER IMAGING has always recommended suitable components to us." He describes the cooperation that has now led to over 1000 implemented vision systems as trusting, reliable and strong. AB Graphic's sales manager particularly values the assistance of STEMMER IMAGING's Support Department, which played a major role with the latest generation of fleyeVision systems in implementing the detection of the labels without sensors, i.e. with no additional trigger. "This function considerably facilitates the integration and use of the inspection system for the machine operator. It simplifies and accelerates the setup of new labels, in particular with larger tape widths, makes mechanical adjustments unnecessary and allows the automatic teaching of new labels within a few minutes!" Wirtz says that this considerably improves the cost-effectiveness of the fleyeVision systems. However, manual teaching of labels is also possible if necessary for special requirements. The fleyeVision user interface allows the extremely fast automatic or manual setup of new labels. The sensorless detection was developed in close cooperation between the machine vision experts at AB Graphic and the Development Department at STEMMER IMAGING on the basis of the Visual Applets FPGA development tool from Silicon Software. The solution thereby created processes the images from the line scan cameras that are employed in all systems from AB Graphic that feature image processing functionality. "The requirements for speed, resolution and thus data throughput are very high in label inspection. With line scan cameras we can cover all variants, which we offer our customers as options", stresses Wirtz. The selection thereby ranges from line scan cameras with a 1k resolution through 2k variants up to models with an 8k resolution in monochrome or colour. Depending on the width of the tape to be inspected, speeds of up to 350 metres per minute and the detection of faults down to a size of 0.02 mm² are thus possible. The smallest detectable distance between two lines or the smallest resolvable line width is decisive for the reliable recognition of barcodes. The limit that can currently still be reliably recognised, for example with a web width of 210 mm with 8k line scan cameras, is 0.08 mm. The vision system is completed by suitable line lighting, which can also be implemented as UV lighting for the inspection of films, as well as the matching lenses and cables, which Ralf Wirtz and his colleagues also procure through STEMMER IMAGING. The operating software, which enables the extremely fast automatic or, if necessary, manual setup of new labels and displays the results of image processing, was developed by AB Graphic itself. STEMMER IMAGING has given us outstanding assistance for many years with the system configuration and the selection of vision components for this demanding task. For me, it's extremely helpful to be able to test the suggested components for new variants on a loan basis and in this way to be able to see for ourselves that a system actual works as planned. The fleyeVision imaging systems are integrated into inconspicuous and compact housings in the systems. Due to the tight installation space, the AB Graphic developers have cleverly extended the optical axis by means of a mirror system in order to achieve the required working distance for the cameras. One further special feature is important to Ralf Wirtz: "Two camera systems can optionally be used in the fleyeVision systems in order either to check the front and rear sides of label tapes or to increase the resolution with large tape widths. Even with such variants, the incoming data from both cameras is captured and processed by a single Silicon Software frame grabber. This illustrates the performance of our solution, which was only possible through the use of high-quality machine vision components, the ideal configuration and the joint development by Silicon Software and STEMMER IMAGING according to AB Graphic's specifications." AB Graphic International had been producing innovative further processing machines for digital printing, automatic winding machines, winding and inspection machines as well as print inspection systems for over 60 years. With production facilities in Great Britain and Germany as well as sales and service points in Great Britain, Germany, the USA, France, the Netherlands and Spain, plus a global network of sales partners, the company offers its international customers comprehensive support. Over the years our requirements have continuously developed and STEMMER IMAGING has always recommended suitable components to us. Hi, I'm Georg Schelle, one of the sales specialists at STEMMER IMAGING.